It is with broken hearts we announce the peaceful passing of our beautiful and beloved Celestina DiBiase. She died with her family by her side on March 28, 2019 at 87 years of age. She was predeceased in 2017 by her loving husband Dino of 65 years. She will be profoundly missed by her three sons, Joe (Amy), Aldo (Rita) and Michael (Maria). Adored nonna to Dean, Bianca (David Nicol), Alexander (Heidi Lahti), Blake, Deanna (Michael Bradie) and Christopher (Gabrielle Malette). Dear sister of Nazareno Papillo (the late Mariannina), Prudenzia Colella (the late Benito), predeceased by Rosa and Salvatore Fusca, and Lucia and Bruno Cannatelli. Beloved sister-in-law of Feliciana and the late Pierino DiBiase. Celestina was a kind and loving Zia to many special nieces and nephews. 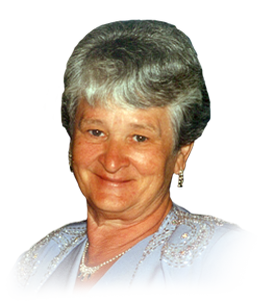 For many years, Celestina was a cook at Maria’s Restaurant in Amherstburg. She cared faithfully for her family and friends through her delicious cooking. Most importantly, Celestina was a selfless and altruistic wife, mother and grandmother who had the most amazing blue eyes and a most radiant smile. A woman of faith, Celestina possessed a gentle spirit who demonstrated goodness and kindness to everyone she met. The family wishes to acknowledge and thank the devoted nursing and care staff at the Village at St. Clair (Harrow) whose dedicated service, compassion and friendship shown to Celestina went above and beyond. In addition, we would like to extend a heartfelt thank you to Feliciana DiBiase, Alberina Vitella, Cheryl Ziter and Renee Malette for the kindness, gentleness and support that they provided. If you desire, memorial tributes to the Alzheimer Society of Windsor & Essex Co. would be appreciated by the family.